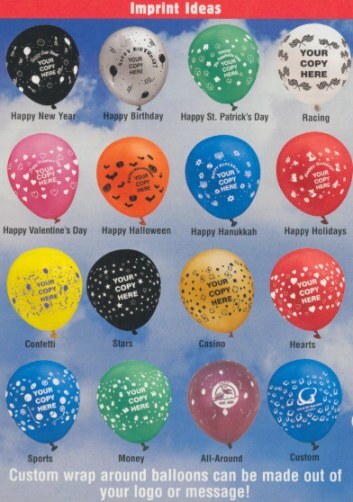 Custom Imprinted Party Balloons, Money, Happy Birthday. NOTE: Minimum order is 1000 units. NOTE: All prices, quantities, sizes and/ or colors are subject to change without notice. Requirements to prepare and/ or to e-mail your artwork to us, click here. Set-up (screen/ plate) Charge: $60.00 complete with stock wrap-round design on all four sides. One color printing only. Imprint Area: 2 1/2" Diameter. For more balloons, click here. For fundraiser, churches, weddings, family reunions, picnics, parades, department store decorations, promotional booths, company and family picnics, employee gifts, holiday gifts, New Years parties, bookstores, birthday parties, quinceaneras; restaurants, trade shows, campaigns, state, county and city fairs; auto dealer show rooms, boat dealer show rooms. For additional balloon ideas, see enlarged photo here. Zenith silk-screen printing. Printing process may create some overlapping and smearing. Printing appears with balloon neck down unless specified. Standard (to select color, click here.). Opaque ( to select color, click here.). Crystal (to select color, click here. ), Metallic (to select color, click here. ), and Pearl (to select color, click here. ). 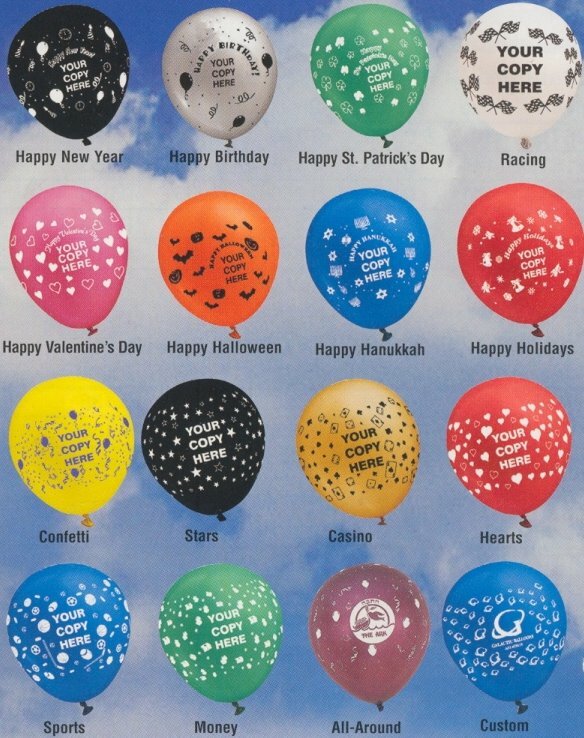 All-Around Printing: Top dome/5th side add $0.0200 per balloon. Imprint Colors: Standard colors. NOTE: If ink color match is needed, please specify the PMS color number and its name. Exact ink color match can not be guaranteed. Bulk. 9" approximate Lbs./1000. 11" approximate Lbs./1000. From receipt of complete order and approved artwork, please allow 6-10 working days production time in the plant on custom or printed merchandise, unless otherwise noted. Call for artwork pricing, information, and guidelines. We reserve the right to ship and bill 5% over or under the ordered amount on custom printed merchandise. To place your order, click here and follow the instructions in the ordering form, or call at the telephone number at the end of each page to place your order. Remember. Customer satisfaction and high quality service to our customers is our primary goal. Requirements to prepare and/ or e-mail your artwork to us, click here.